Whenever I'm not feeling well – especially once in a month – I'm making muffins. 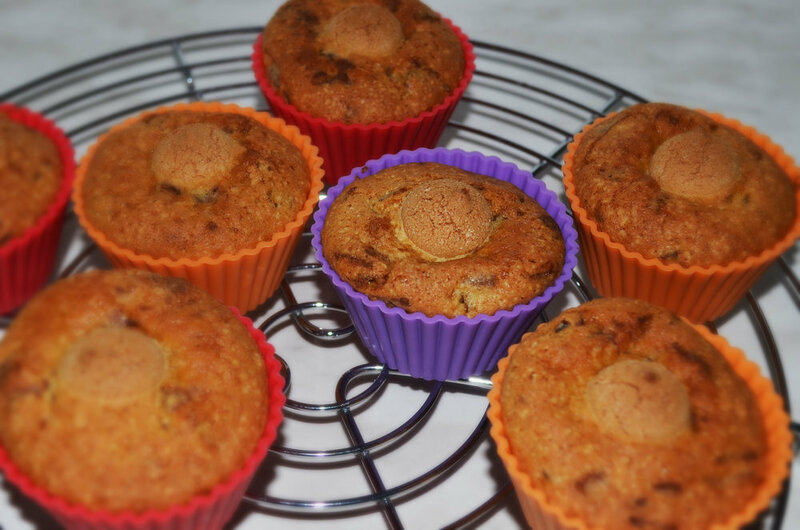 Making muffins makes me m-happy, snacking on the rest of the dough makes me happy, and eating muffins – well, you get. This time, I wanted to do something with some leftover cranberries and chocolate chips; however, I couldn't find a recipe that wouldn't include me going to the supermarket to buy additional ingredients. Being the lazy person I am, I'd rather experiment with the stuff I already had at home, confident that 15 years of muffin-making would give me enough expert knowledge to at least create something edible. So I mixed some eggs with some sugar and a pinch of salt, added sifted flour, baking powder, baking soda and lemon zest, also some oil and milk, stirred in the cranberries and chocolate chips and, just for the fun of it, popped an amarettini cookie into each portion. In theory, the cranberries and chocolate should be evenly mixed and the amaretto sitting in the middle of the muffin as a surprise.